The structure of the protein that causes Huntington's disease, revealed - HDBuzz - Huntington’s disease research news. The cause of Huntington’s disease has been known since 1993, but the physical structure of the healthy huntingtin protein proved difficult to discover until now. 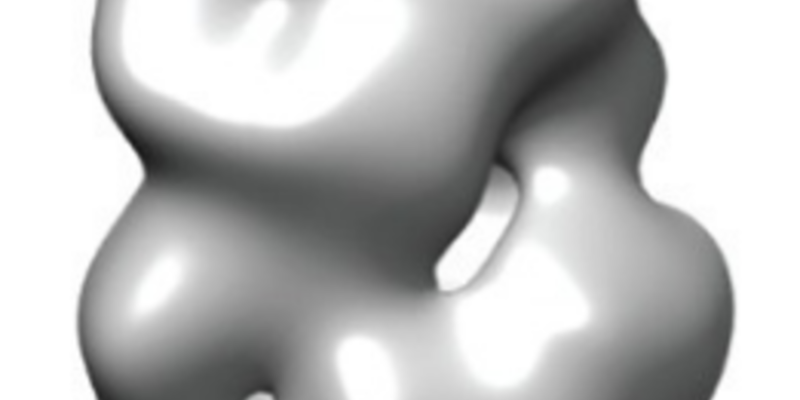 German scientists have now revealed the shape of the huntingtin protein for the first time. Although the structure of the mutant form of the protein was not investigated, this study provides an excellent platform to build upon and will boost drug development efforts. One of the biggest issues in HD research to date is that although we know what causes the disease - a harmful protein called mutant huntingtin. We even know some ways in which the mutant protein wreaks havoc within the human brain. But until now we’ve had no idea what the protein actually looks like. That makes trying to prevent it causing damage very difficult! Imagine you’re a farmer whose crops are being damaged by an animal every night. If you had a photo of the animal that was causing the damage, it would be easier to figure out how to prevent it. A drunk elephant would require a different strategy from a swarm of locusts. It’s the same when we’re fighting brain diseases: knowing what a protein looks like is a huge help when it comes to understanding how it operates and how to make drugs to change its behaviour. 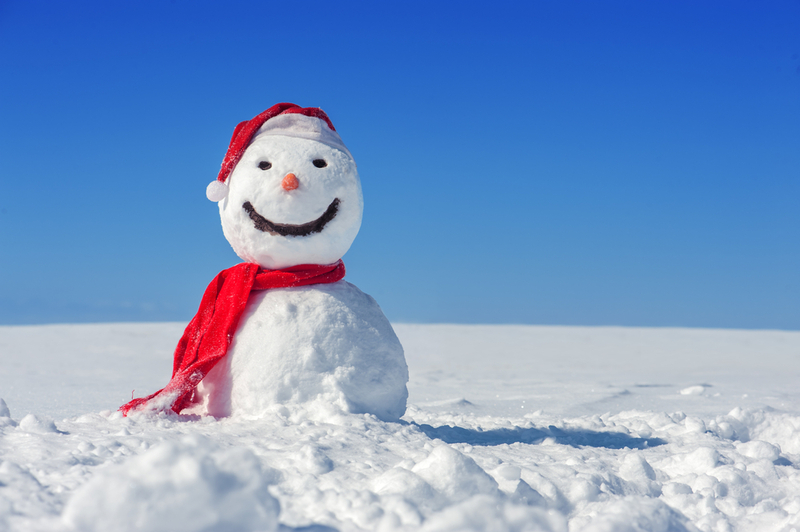 Things tend to slow down when it gets cold. Cryo-electron microscopy uses low temperatures to hold protein molecules still, then an electron beam captures hundreds of ‘photographs’. The technique used in this particular study is the crème de la crème of microscopy, so much so that it was awarded the Nobel Prize for Chemistry last year. It’s called cryo-electron microscopy, otherwise known as cryo-EM. It involves shooting a beam of electrons at a sample that’s been frozen using a super-cold liquid. When we say cool we don’t mean like a beer or a smoothie – this technique involves cooling proteins to several hundred degrees below freezing. When the electrons hit the sample, it causes them to scatter slightly before striking an electron detector, which builds up an image like the light detector in a digital camera. But one image isn’t enough - hundreds of ‘photos’ have to be taken from different angles, then combined by computer to reveal the 3D shape of the protein. The images generated by cryo-EM are so precise that the authors of this study – a team led by Stefan Kochanek at the University of Ulm – were able to document the structure of huntingtin down to a billionth of a centimetre! The study found that the protein was essentially composed of two parts, connected by a bridge region. This is a very important finding as it suggests that the function of huntingtin could be to act as a kind of protein hub. In other words, it’s a mothership that lots of different protein spaceships dock into. You might be thinking to yourself, why has it taken such a long time to figure this out? Basically, it’s due to how complicated and bendy the huntingtin protein is. In order to build up a 3D image of the protein, it has to be photographed from multiple different angles, but for the pieces of the puzzle to slot together perfectly, the protein has to remain in the same position for this entire process. Unfortunately for us, this doesn’t happen with the huntingtin protein alone. To get around this, the researchers of this study used another protein called ‘huntingtin-associated protein 40’ or HAP40, which was able to bind to both segments of HTT as well as the bridge region and essentially fix it in one position, to stop it moving around. This stabilised the protein for long enough that the ‘photoshoot’ could take place. What about the mutant protein? 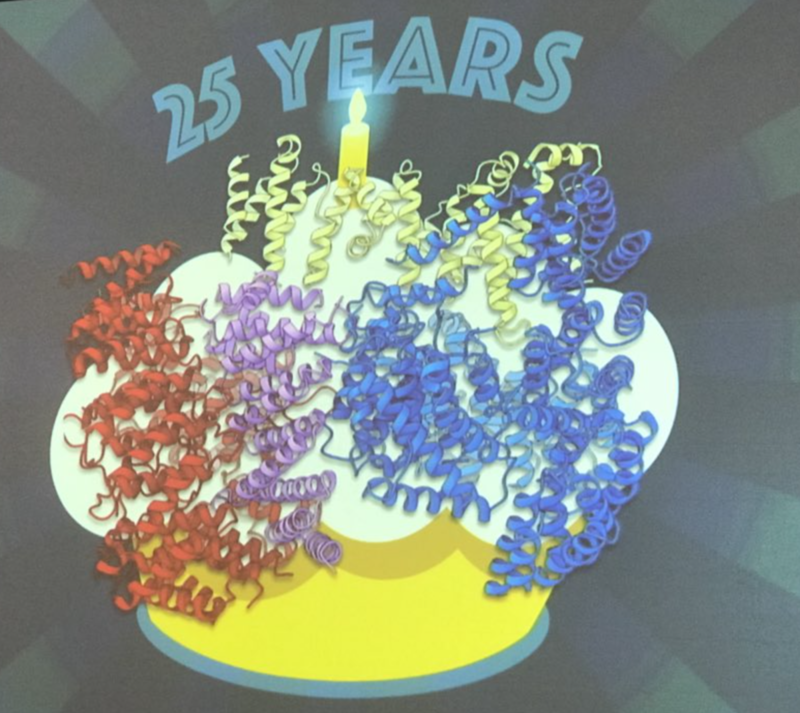 Dr Kochanek unveiled the structure of huntingtin (the squiggly ribbons) in February at the therapeutics conference, as a birthday present to the HD community celebrating 25 years since the discovery of the gene. The structure that was just announced was of the normal, healthy huntingtin protein that scientists call ‘wild-type’. But what about the structure of mutant huntingtin? Surely we need to know the what that protein looks like, to actually help in HD? On the one hand yes, there is still an urgent need to identify the structure of the harmful version of huntingtin, and that would be super-helpful for designing therapies to combat the mutant protein’s harmful effects. However, that poses a whole host of other potential challenges to researchers. Unfortunately, the presence of the mutation changes the the way the protein interacts with other proteins. That’s probably one of the things that makes it harmful. Remember that the success of the photoshoot depended on huntingtin sticking to another protein, HAP40. But the presence of the mutation may mean that huntingtin and HAP40 no longer stick together so well, meaning the cryo-EM photoshoot doesn’t work so well. The authors hinted at this problem in their article. The structure of the mutant protein will hopefully come in time, now that the healthy one has shown its face. But just knowing the structure of the healthy huntingtin protein is already a big deal. Despite decades of research, we still don’t understand all the jobs huntingtin carries out in our cells, not just in the brain but the whole body. But since the structure of a protein basically dictates how it interacts with other molecules, we can now use these results to work out what different functions huntingtin might have, and how it achieves them. Essentially, this finding is a lightbulb that means we’re no longer shooting in the dark to understand and reveal huntingtin function. Finally, this finding will be a big boost for efforts to invent new drugs to fight Huntington’s disease, especially if it does lead to uncovering what the mutant protein looks like. It could enable the design of targeted drugs that make the huntingtin protein less toxic whilst protecting the helpful functions of the healthy protein. Hopefully, this discovery will kickstart a new era for targeted drug development in Huntington’s disease, focused on the known structure of the huntingtin protein.